Here's what Adult Fitness ​looks like at MSSC! All classes are held at Mt. 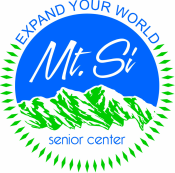 Si Senior Center. 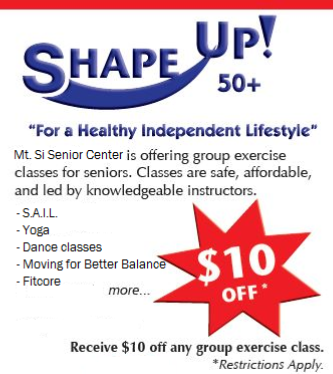 Come try a class for free using the Shape Up discount. Available to adults age 50 and older. Huff & Puff focuses participants on maintaining mobility, flexibility and strength. The class uses hand weights, exercise bands, floor mats and chairs. Enhance Fitness helps people reduce their chances of falling through exercises that build strength, flexibility, balance and cardio fitness. An introduction to yoga’s beneficial poses and mindful practices that improve physical fitness and overall health and vitality. Instruction is tailored to student’s skill level. Meet up with other people to walk in the afternoons! Call us for more information. Seniorcize is a senior strength and conditioning program that is easy on the joints with seated aerobics, balancing and stretching exercises. ​Moving for Better Balance is a research-based, balance training program designed for older adults at risk of filling. You never need a partner to have a great time dancing with your friends. Plus you get exercise without realizing you are actually working out! This strength, balance and fitness program is geared toward adults age 65 and older. In class, you will be performing exercises that improve strength, balance and fitness. These are some of the most important activities adults can do to stay active and reduce their chances of falling. This boxing-inspired circuit training course will improve cardio conditioning, movement and balance. You will also learn boxing basics and expand your skills. This class is currently on hold. If you are interested in Zumba Gold, let us know! Download Shape Up Coupon and present for $10 off eligible classes.